It was a beautiful sunny morning when I pulled up to Mary’s house. I was immediately relieved of feeling hot by a cool east breeze off of Lake Michigan, which is only a few blocks away. As soon as I started unpacking my cameras and tripods, I found myself greeted by Mary and her generous offer to help carry my things over to her gardens. I was definitely grateful for the help. 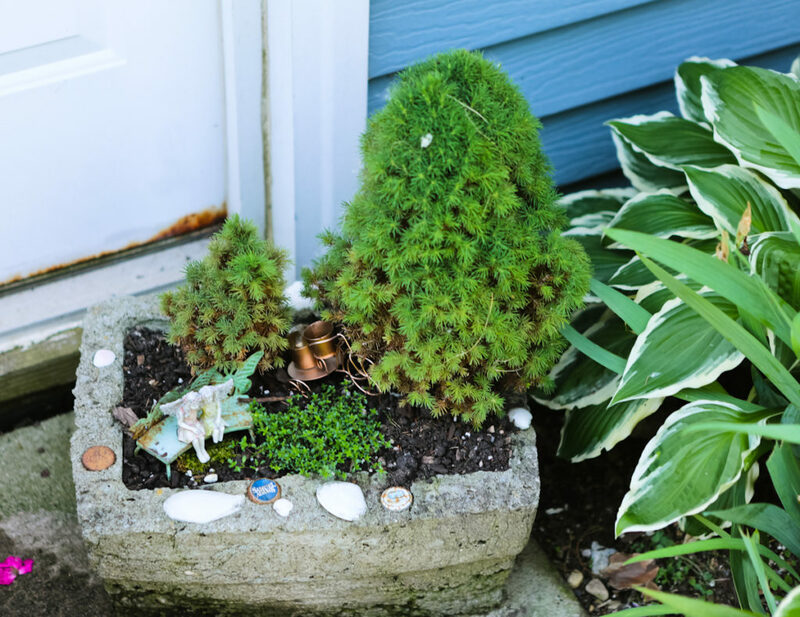 She walks me to her backyard, and I am immediately noticing that she, #1 has a green thumb, #2 is obsessed with adding gardens and #3 is very creative and talented. She guided me up the deck steps to her outdoor dining table. She offered me a seat in the shade, while I got my equipment set up. Out of the house door, came her husband, Steve. He immediately offered me coffee, and of course, I accepted. I love coffee in the morning, especially with people who have the same interests I do. I soon came to find out that Steve has just as much of a working hand in the gardens, as Mary does. They each have their own ideas how they would like to see varieties planted and placed, so luckily for them, they have a lot of gardens to play around with. Mary and Steve showed me pictures of what their gardens look like at other times of the year in a picture album that they keep. They have beautiful tulips and other early spring bloomers that were just impressive. 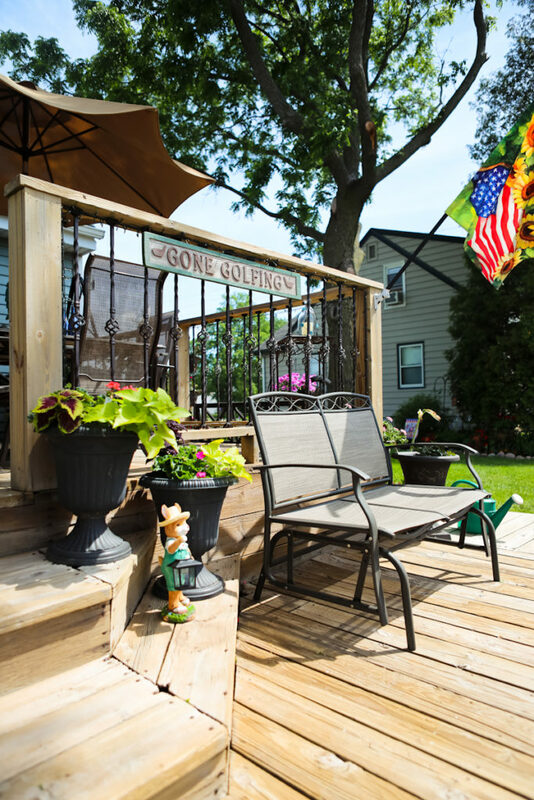 Their gardens will be featured in this year’s, 2017 South Milwaukee Garden Tour, on June 24th, and they plan on putting that photo album out on display so everyone can see what the gardens look like throughout the entire year. Mary said that her favorite plants to watch grow and blossom are her lilies, and her favorite garden is her wildflower garden. 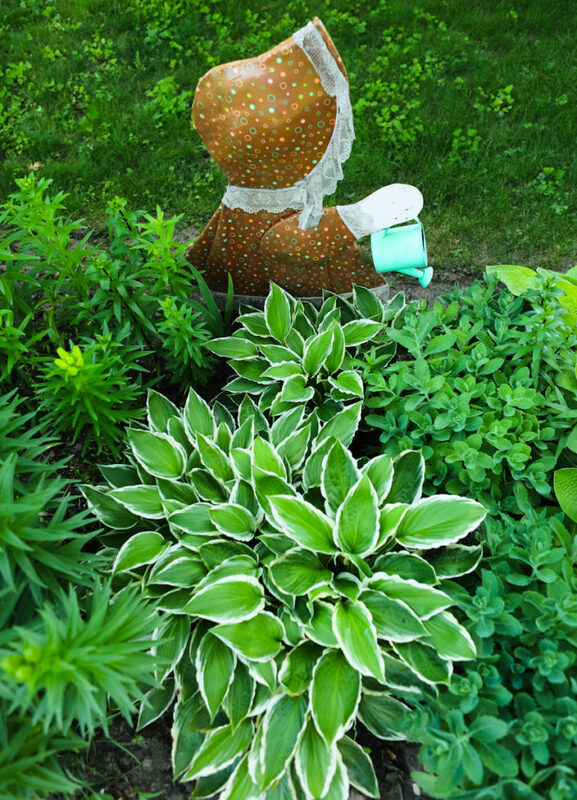 In her wildflower garden she has varieties such as cosmos, rudbeckia and coneflowers. Unfortunately, I only saw it green, which was still impressive. I didn’t come at a time that these varieties are in blossom, but I can only imagine the explosive amount of color that garden provides through the Summer months. After spending quite a bit of time with Mary and Steve, they started having more fun with the interview. They were even joking, and telling me stories about their gardens and of their recent travels to Hawaii. I asked them to do some garden work while I took pictures, and Steve grabbed the hoe and told Mary to start pointing. We all had a chuckle! That’s when Mary earned the title, Project Manager. Steve said that when he and Marry got married 8 years ago, that his yard started to transform into a beautiful backyard. As he said this, I could tell that he was very proud of Mary’s vision and what they have created together throughout their yard. Steve loves perennials more than anything, because he doesn’t have to replant them every year. His favorite part of their yard, is his raised bed vegetable garden. He grows one of many varieties. Some of the varieties planted in his garden are tomatoes, lettuce, onions, chives, yellow beans, radishes and more. One thing I learned very quickly, was that these two like to winter over some of their plants. One of their favorite plants to winter over are Spikes. They got one so huge after having it for a few years, they nicknamed it Spike! 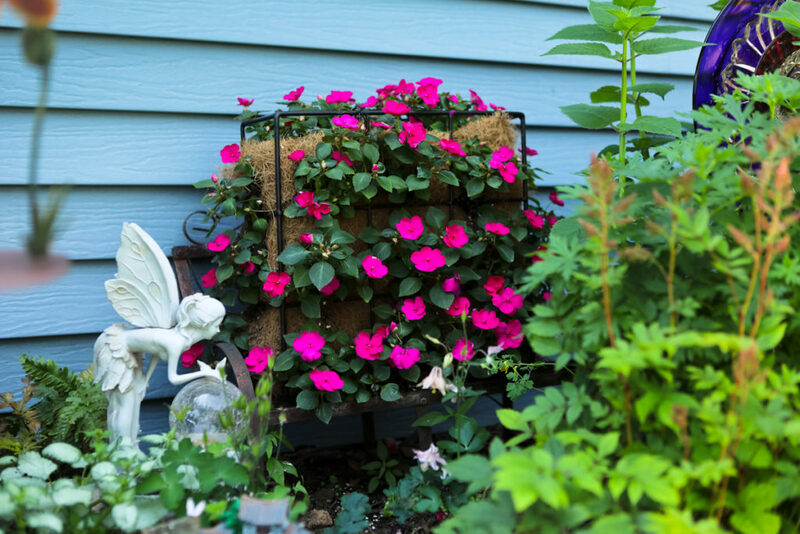 They use their wintered over spikes throughout their beautiful container combinations. Every Spring, Mary brings up her plants from the basement, and revives them by bumping them up into larger pots and adding some new soil. Mary and Steve have many gardens and garden themes. The one that I thought was the most creative was ‘The Bike Garden’. It’s a beautiful, shadier garden with all different kinds of small decorative bikes. The coolest one was a bike made out of wine bottles. Mary said you need to drink the wine first, then Steve blows the glass and creates the object that Mary is imagining. There are bikes that are planted up, and bikes that are windmills. You will find a lot of red in Mary’s Garden, since red is her favorite color. She loves the way the color red pops against all of the green in her yard. 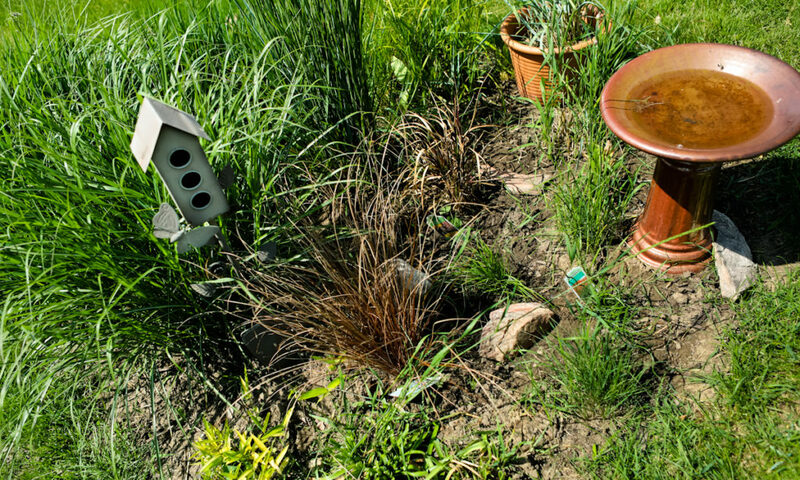 There’s a spot in their yard where they were hesitant to create a garden. They were told that nothing would grow there and that they should just fill it in with grass seed. Well, of course, Mary said no way and took her chances. That’s when her and Steve started creating their blue grass garden with specialty perennials and stepping stones that have a border of sweet smelling white alyssum. In the summer, when that lake breeze kicks in, the smell of alyssum fills the air and travels all the way to the back patio where they like to sit and enjoy their hard labors. She also likes to try out new bulbs and plant varieties every year. 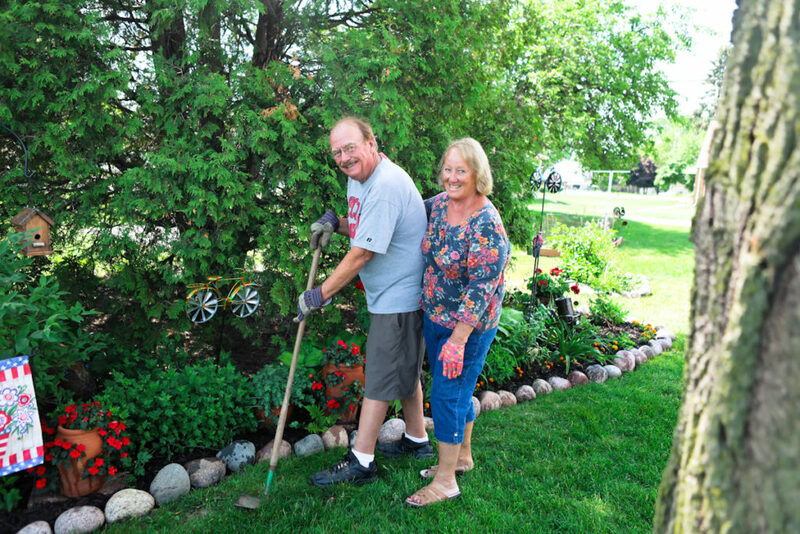 Mary and Steve have found that they have the same passion and feeling of peace when it comes to gardening. Even though their backs may be sore at the end of the day, they look around and feel good about the work they just did. I saw this really cool planter they had for growing tomatoes. 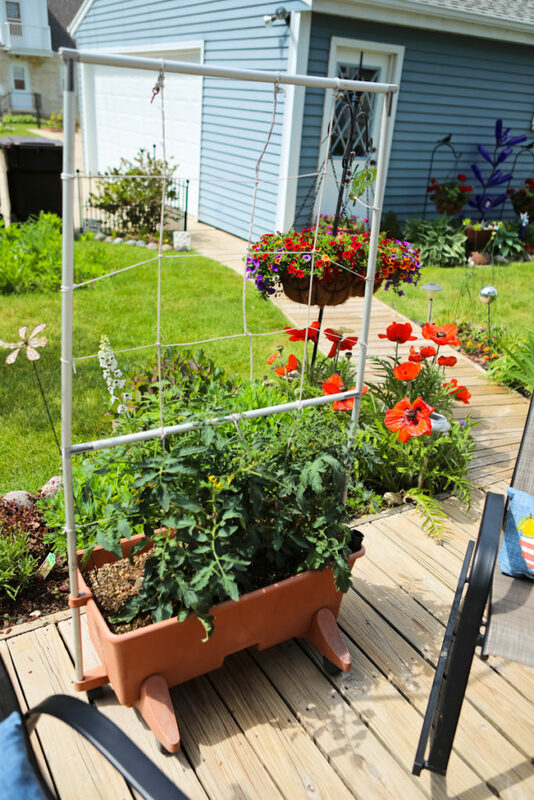 It basically makes watering easier, provides a trellis for the tomato and it’s on wheels! It doesn’t get any better than that! In this planter they are growing Early Girl Tomatoes, and they are already seeing yellow blossoms, which means tomatoes will follow. When you are in Mary and Steve’s yard, you can’t help but be distracted by the Large, Orange Poppys in blossom this time of year. The flower was larger than my hand! Above the Poppys, Marry buys small hanging baskets and transplants them into her more decorative hangers. By bumping these combinations up into a larger basket, they then grow larger and last all season. The best thing is, she doesn’t have to make her own combination. It’s already done for her! The variety of the flowers are Million Bells, ‘Calibrachoa’. This variety can take the cooler temperatures that come early in the late Summer season, when you live right by the lake. Above is Mary’s Rose Garden. She has roses that are of pink, yellow and red hues, along with a border of marigolds to help with the rabbits. Steve and Mary went and picked out each and every stone that borders their gardens. They said that it was fun, and a project they both enjoyed. They like a more natural appearance in their gardens. 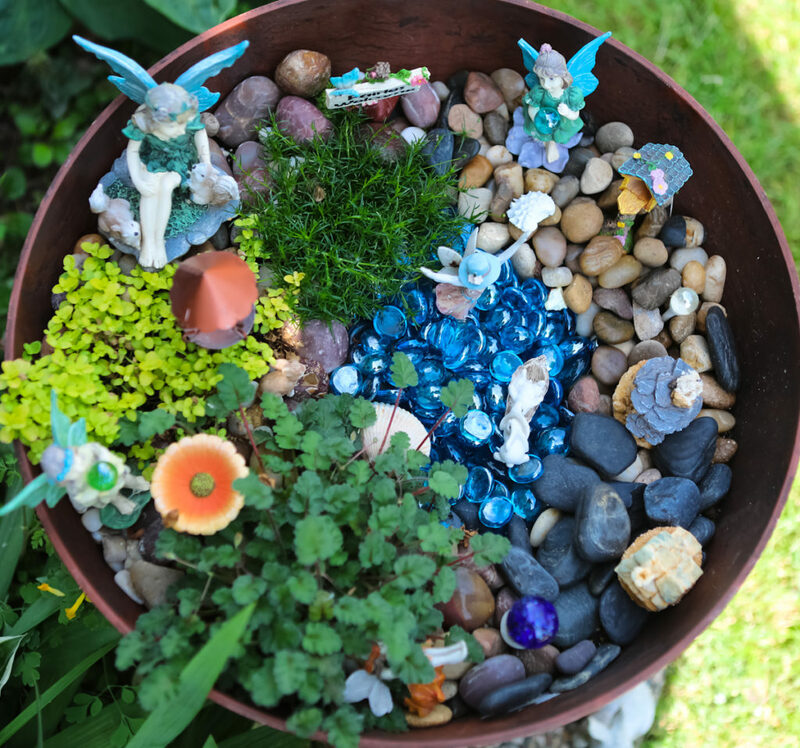 As we walked on, Mary had an entire garden decorated in fairies. 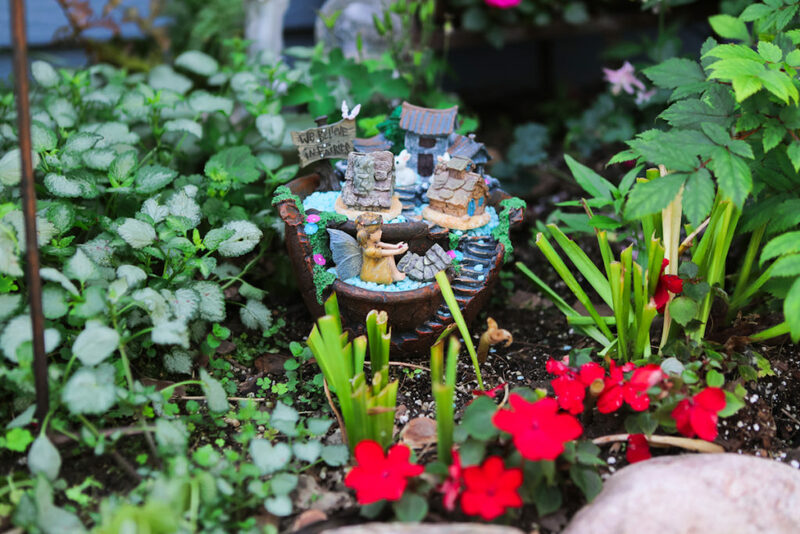 I asked Mary why she chose fairies, she said, “They’re just really in right now, and everyone goes crazy for them.” Here are some images that show Mary’s beautiful Fairy Gardens, along with the beautiful garden art that her husband Steve helped create. What I also found in their yard, is what Mary and Steve call, their grass garden. This garden is all different varieties of grasses that are perennials in the Midwest temperatures. They said this garden draws a lot of birds, once the grasses seed out. After the birds come and eat their seeds, then they watch them play in the bird bath. Here are a few more photos I took along the Garden Tour of Mary and Steve’s yard. 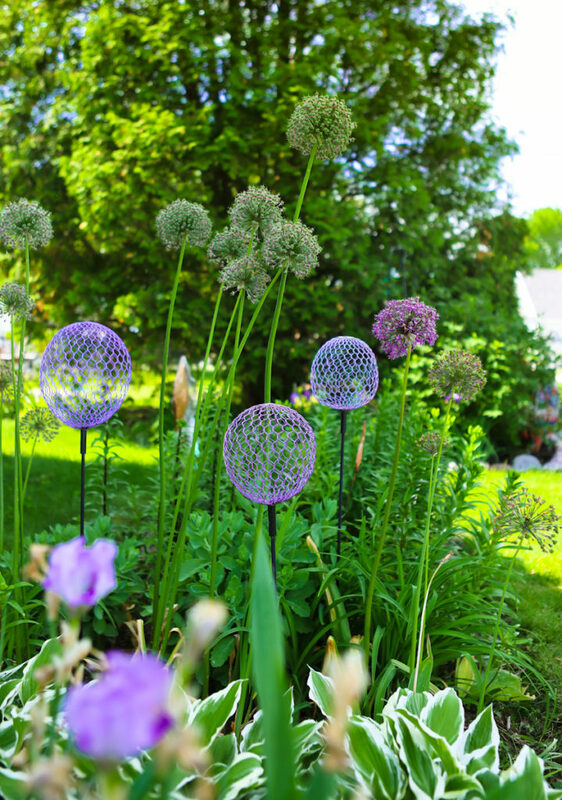 Mary and Steve told me that they spray paint their Alliums in their yard. (Pictured below) Steve said, “The color on the flower only lasts so long, but the actual flower sticks around a lot longer. So we go ahead and spray paint them the color they were with outdoor spray paint, and they last a really long time.” I found that so interesting. What a creative idea! As I walked around to the front yard, there were more surprises to find. At this time, when I was taking photos, Mary and Steve went inside to clean up for their afternoon plans. 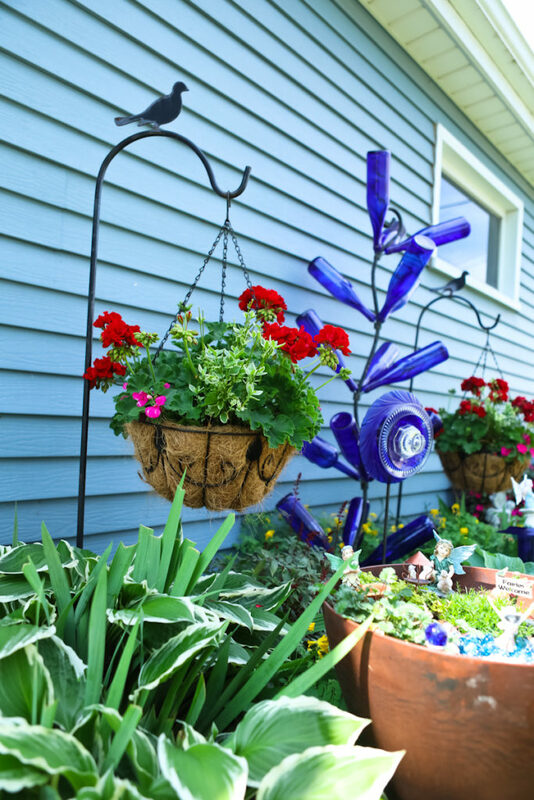 When they came out, I had to get a picture of them all spruced up on the front porch with their colorful landscape. By this time they were used to me, and their full personalities came out, as you can see in this picture. Here are a few more pictures I took as my tour was coming to an end. You will find that Mary and Steve are very creative throughout their gardens, and they add a touch of their personalities throughout as well. 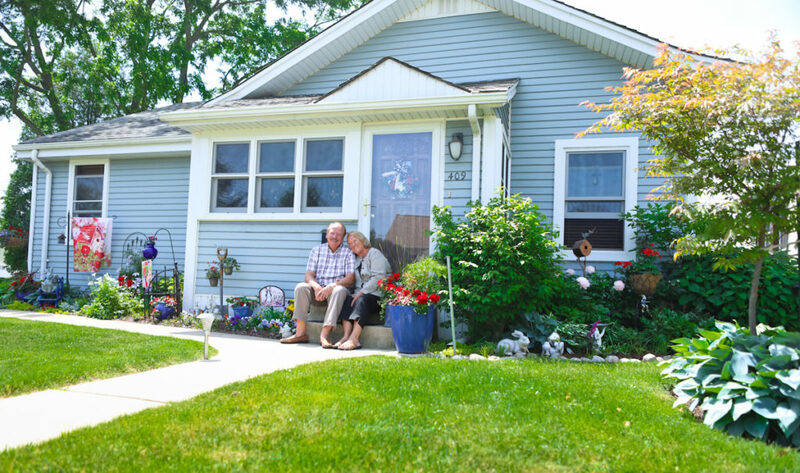 Their styles combined, create the perfect yard to sit and relax in. By the end of the tour Mary and Steve gave me, I got a sense that there was more to their gardens than the varieties in them. It’s their hard work, creative minds and the love they share for gardening. Their gardens aren’t just a look, they’re a feel. You won’t be able to just take a glance at these gardens, because there will be something that draws your attention and willpull you in. That’s when I realized, this isn’t just Mary and Steve’s Garden, this Mary and Steve’s world. If you’d like to see more of Mary and Steve’s Gardens, you can see them in the 2017 South Milwaukee Garden Tour on June 24th. They will also be featured in the 2017 South Shore Garden Tour on July 8th.